DR. JEANETTE Y. SON D.M.D. 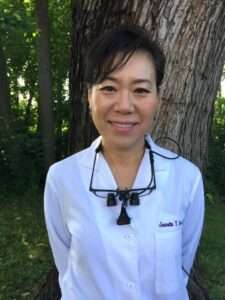 Dr. Jeanette Son opened the office, and began practicing here in 1994 after she finished her doctoral degree from University of Pennsylvania School of Dental Medicine. Dr. Son is happily married, and is the mother of three children. She is a youth group leader, and is actively involved with her church. She is bilingual, speaking both English and Korean. Among many other activities, Dr. Son enjoys watercolor painting and vegetable gardening. Her artistic interest, talent, and skills are also reflected in the dentistry she performs. Dr. Son approaches each individual patient and procedure with patience, genuine kindness, attention to detail, and our patient’s concerns and needs. © 2016. Jeanette Y. Son DMD Family Dentist. Developed By TAF JK Group, Inc.